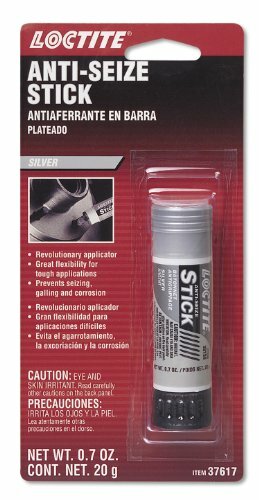 Loctite 37617-6PK Silver-Grade Anti-Seize Lubricant, 20-gram Stick, (Pack of 6) by Loctite at Beaver County Collision. MPN: 37617-6PK. Hurry! Limited time offer. Offer valid only while supplies last. The Silver Anti-Seize Stick is a heavy-duty, temperature resistant, petroleum-based lubricant compound fortified with graphite and metallic flake. The Silver Anti-Seize Stick is a heavy-duty, temperature resistant, petroleum-based lubricant compound fortified with graphite and metallic flake. Will not evaporate or harden in extreme cold or heat. Use during assembly to prevent seizing, galling and corrosion. For use in assemblies up to 1600°F (871°C). Great for removal of spark plugs, cylinder head and exhaust head bolts.